Here’s a little tip – don’t check your work email on your mobile phone while riding in an airport shuttle on the way back to your car from vacation. Don’t quickly open any emails saying you had a recent sign-in attempt and need to remedy your information. Don’t click the link! DON’T do it. Yep, it was me. The person who studied and learned about fraud, email phishing, social engineering (and a lot of other terrifying cybersecurity issues) for a 1,200-plus word story for BizVoice® magazine last year. The person who has warned everyone about these issues since learning all those terrifying things. The one who pays close attention when data breaches are discussed in the media. It was me. I did it. Ugh. Thankfully, I realized what I’d done nearly immediately. I clicked on the link, but I didn’t enter any information and I quickly alerted our network guardian angel administrator, Jeff. Then I panicked all the way home from my relaxing vacation. But Jeff let me know he was keeping an eye on it, and that I hadn’t broken everything (I was sure I had). Such a relief I have rarely felt in my adult life. After a self-admonishing mea culpa when I returned to the office, I was again put at ease upon being reminded that this happens more regularly than I realized and that it’s a very easy thing to fall for. That is NOT an excuse for complacency, of course. Think before you click! 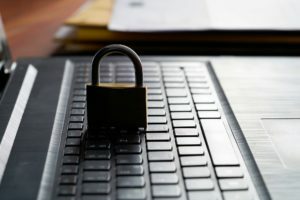 Make sure you know your company’s security protocols, think critically about the email address the email is coming from (does your security administrator typically handle anything related to Microsoft? Then Microsoft is probably not emailing you directly!). Just pay attention. I was reminded firsthand that our information technology and network security administrators are on the front lines of keeping our dumb mistakes at bay. If you’ve got a great networking security team supporting your workplace, thank them when you get the chance. You probably don’t always know or understand what they do, but when things get dicey, you’ll really appreciate their expertise. Celebrating Failure or Something Else? Kris Taylor focuses on change and change leadership in her coaching/consulting practice. 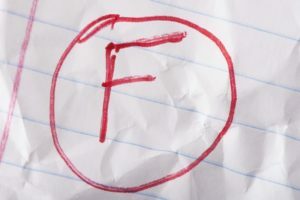 In a recent writing, she questions the “celebrating failure” message. Or maybe it’s the wording used. Decide for yourself. The full post includes additional information on organizational behaviors to remove and embrace. Face it: Failure stinks. No one I know likes it. And even the most successful and creative people I know, don’t celebrate things that turned out poorly. Yet a mantra that has emerged in the last five years is to “celebrate” failure. Really? Celebrate? While I get, on some level, the reasoning to encourage people to take a risk and actually “do something” or to even possibly do “something big” – the notion of celebrating failure is not, what I believe, is in anyone’s best interest. Working in and with organizations, I fully recognize the great extents to which people will take to avoid looking “less than” or “foolish” or “incapable”. I also fully recognize the games that are played (some with intention and some unconsciously) to garner the coveted raise or promotion and at times, survive the latest reorganization. Anything “less than” often is hidden, buried, ignored or rationalized away. I’ve seen multi-million projects that were abject failures be allowed to linger on, all to avoid embarrassment. I’ve seen amazing amounts of money, time and effort be put into a failing project in an attempt to prop it enough to get it over the finish line, only to declare “done” and then allow it to wither away. And so, let’s celebrate creativity and contributing new ideas. Let’s celebrate experimentation, observation and rapid learning. Let’s celebrate bold steps forward into the ambiguous unknown future. Let’s celebrate persistence and pivots and progress. And when we fail, we celebrate picking ourselves up, reflecting on what happened, and starting anew – smarter, more resilient and more likely to succeed this time around. Did you see Eli Manning and Odell Beckham Jr. dancing to the routine from “Dirty Dancing” last night during the Super Bowl’s commercial lineup? Granted, I did not watch the Super Bowl in its entirety, so I missed several of the commercials – but that one might have been my favorite. I also enjoyed the marketing gusto behind the “It’s a Tide Ad” commercial. Did you have a favorite? 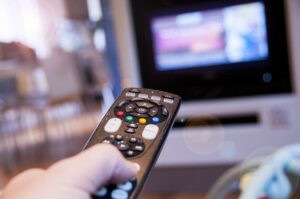 While the actual football game was exciting, the commercials were a mixed bag, with a few bright spots among some duds, per usual. TVision’s ranking system uses a score of 100 as a baseline, so numbers higher than 100 represent better than average performance. Here are the top 10 spots that got attention from viewers in the moment when they aired last night during the game. Note how different this list is from the spots that resonated most on social media or in earned media views online. If you’re like me, you probably made a few resolutions for 2018 and you may or may not be sticking to all of them. 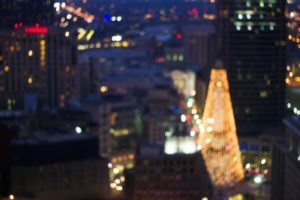 But now that it’s just February, you’ve had ample time to adapt to some new life habits and still plenty of time to call any such habits “New Year’s” resolutions. Maybe it was to work on your health (that’s one of mine! ), or perhaps it’s to be more present with your family (okay, also me!) or get more sleep to help with all facets of life (me again. Hmm, I’m sensing a pattern…). Figure out your to-do and not-to-do list and don’t do unnecessary things because it can hamper your productivity and slow you down. Automate your life – the article mentions a few apps to help you automate everything from your home’s thermostat to adding events to your calendar and more. And maybe you’re in a position to outsource tasks. Is it time to consider hiring an assistant (even a virtual assistant) to help manage your day-to-day tasks? 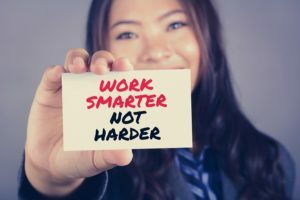 It could be that hiring the kid down the street to come mow your lawn once a week frees up enough of your time and energy to be more productive. Whatever you’re doing to improve yourself or your work in 2018, keep it up; because then we’ll all have fewer resolutions to try and keep track of in 2019. Do you have room in your holiday calendars for a few wintry Indiana activities? Maybe you’re in need of something to entertain your children over winter break, or you’re in search of fun activities to get yourself in the holiday spirit. Festival of Trees: The Indiana Historical Society has 80 Christmas trees decked out in Hoosier-related flair through January 6. Dates, times and ticket prices are available here. You can also check out the Indiana Experience while you’re there. Lights at the Brickyard: What’s more Hoosier than the Indianapolis Motor Speedway? Take a drive around the oval and cross over the yard of bricks while you take in over 2.5 million twinkling lights (set to music, if you choose). This year’s expanded route is more than two miles long. Be patient on the weekends for long lines, but weeknights experience typically lighter traffic. Get tickets and times. Christmas at the Zoo: Another Indianapolis staple, Christmas at the Zoo features the animals that don’t mind the cold and lights throughout the property. Get tickets online. Jingle Rails at the Eiteljorg: If model trains are your thing, this is the place to be. Nine working model trains zip past Indiana landmarks and then out west to some of America’s natural and man-made wonders. New this year is a model train trip to Hollywood. The event runs through January 15. Tickets and dates available here. L.S. Ayres Tea Room: Though L.S. Ayres department store closed downtown in 1990, the Indiana State Museum has recreated the famed L.S. Ayres Tea Room as a restaurant with a heaping side of nostalgia for those that recall dining in the original. It’s impressive – the ambiance and lighted windows give the feel of being on the eighth floor of the department store. The tea room is open through January 7 and includes special events such as Santa’s Holiday Breakfasts and Tea with Raggedy Ann. Polar Bear Express: Put on by the Indiana Transportation Museum, the Polar Bear Express train ride departs from Kokomo or Logansport and features an approximately 75-minute trip, complete with candy canes, hot cocoa, a holiday story read aloud and, of course, visits from Santa and Mrs. Claus. Tickets are $35 per person (kids too) and reservations are required. Veal Family Ice Tree – For several years, my family lived near Shelbyville and when we’d drive on Interstate 74, my brother and I would always keep an eye out for the colorful ice tree that peaked out among the foliage. That’s the Veal Family Ice Tree! While this one is definitely off the beaten path, it’s a nostalgic place for many. The ice tree typically takes shape in January and is melted by March. This one is, of course, dependent on the weather. So, if you’re one of those that loves a freezing winter, take advantage of a Hoosier original! Check their Facebook page for updates. We know there are many more things to do in Indiana during the winter months than what we have highlighted here. Did we miss one you love? Let us know in the comments! What do you enjoy doing this time of the year? You’ve probably seen at least one cringe-worthy “apology” statement from a company CEO after the organization got caught for bad behavior. And we put the “apology” in quote marks because the word “sorry” doesn’t seem to make an appearance, or it’s tucked into a “sorry if we offended anyone” sort of phrase (which isn’t really an apology). One thing is for sure: There’s a big difference between a real apology and a #sorrynotsorry apology. A major component is authenticity in the statement. And people (read: customers) can tell the difference. Grammar Girl recently posted this list of four types of apologies to avoid, along with a template to follow for an authentic apology. Luckily, there’s a foolproof template you can use. And the template’s not a trick. If you follow it step by step, it helps you explain clearly what you did and understand how you affected someone else. Rather than having you “fill in the blanks,” it helps you find the words to say what you really mean. 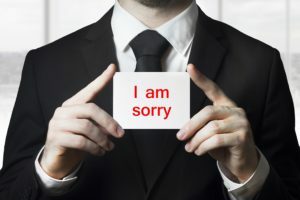 This may seem a little much if you’re apologizing for a small offense, like eating the last of someone’s ice cream, but we’ve found that the little offenses sometimes sting the most. Eating someone’s ice cream becomes a proxy for how little respect you have for them. Or how few boundaries you have. Or how you’re a taker and not a giver. Hopefully you aren’t in a position where you have to publicly apologize for something. But, even if you just need to say “sorry” to someone in your personal life and are having a hard time figuring out the right way to do it, we hope this guide helps get you back in good graces. Pumpkin spice lattes, campfires and a crisp coolness in the air. ‘Tis the season of autumn. The unusually warm weather we’ve been having can’t spoil that wonderful fall feeling. I will eat pumpkin cookies and don cozy sweaters while it’s 80 degrees outside (no shame in my autumn game). However, I feel the cold wind blowing this way with temperatures in the 60-70 range. Grab your boots and fleece jackets, folks, we’re going to some of Indiana’s best fall festivities! Let’s start with the obvious fall activity: picking pumpkins and apples from local farms. While it may be easier to visit the nearest grocery store, nothing compares to the authentic experience of getting it right from the grower. Lucky for us, Indiana has plenty of farms to choose from. Beasley’s Orchard– pumpkin patch, apples orchard, corn maze, hayrides, barnyard bonanza and apple cannons. Each year, the farm hosts the Heartland Apple Festival packed with fun activities, live music, wine tastings from Indiana wineries, delicious food, and arts and crafts vendors. This year’s festival will be held on October 7-8 and 14-15. 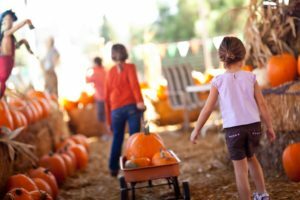 Hogan Farms– pumpkin patch, corn maze, hayrides and petting zoo. The farm also has a haunted corn maze (dates will be determined soon). Waterman’s Family Farm– pumpkin patch, hayride, corn maze, straw “mountain”, exotic animal interactive experience, bounce houses, live music and more. There’s more fall fun to be had outside the agricultural world. Indiana has so many fall festivals throughout the state, it is difficult to choose which to visit! My mom and I have a yearly tradition of visiting our favorites near my hometown of Spencer. However, I have been wanting to branch out to other festivals. Parke County Covered Bridge Festival-if you love crafts, gift items, yard sales and delicious food, you will love this festival! Be sure to bring a cart/stroller and comfortable shoes, you will need it. Also, a visit to the Bridgeton Mill is a must! It is one of the oldest operating mills in the country. Indianapolis ZooBoo– exotic animals, fun activities, music and delicious treats. Need I say more? This event runs Thursday-Sundays throughout October. Germanfest at the Athenaeum– celebrate this cultural tradition on October 14th. 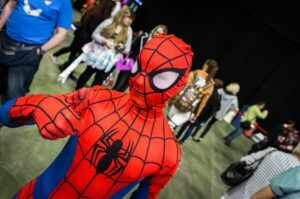 This event is for family-friendly with plenty of activities for the kids. For more festivals, check out the Indiana Festivals Guide to search in by county, city and region. To be honest, I’m a scaredy cat and do not enjoy going to haunted houses. I have been to Indy Scream Park and would recommend it to those seeking shrills and thrills. Indiana Haunted Houses is a fantastic resource for haunted houses, hayrides, mazes, etc. Check out a few attractions listed on their website. There are many more festivities throughout our state I did not mention. A simple online search with reveal all the possibilities. There are some unifying, once-in-a-lifetime, bucket list moments that help melt away the anxiety, sadness and fear of uncertain times and national tragedies. 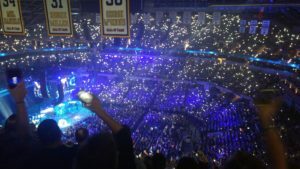 It might sound effusive, but being at the first Garth Brooks performance in Indianapolis on Thursday – his first in our city in 21 years – was one of those moments for me. And it certainly felt like the other thousands of attendees and even Brooks himself (who said on several occasions that he “needed this”) felt the same. Without directly speaking of the largest mass shooting in American history, at a country music festival in Las Vegas on Sunday where 58 were gunned down and over 500 were injured, the tragedy loomed large in the arena. 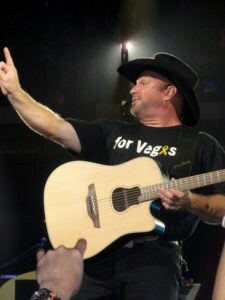 Brooks and his wife, award-winning musician Trisha Yearwood (who joined him on stage on two separate occasions), both wore black shirts with “for Vegas” across the front. Both mentioned needing a cheering crowd and the chance to entertain people through music and laughter and fun. 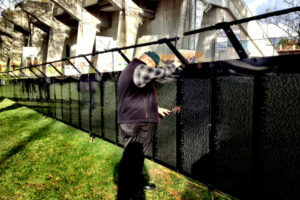 It was heightened security outside of Bankers Life Fieldhouse that served as our first, stark reminder that we were doing just what those other country music revelers were doing less than a week ago. There were armored vehicles and horseback mounted police out front, K-9 dogs both inside and out, many more officers than usual and long lines for security screenings. 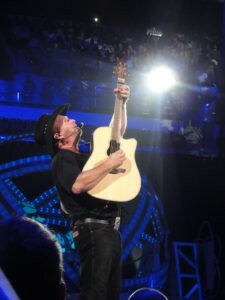 Known for his goofy entertaining style, there was plenty of Garth Brooks just being Garth Brooks. He delighted the crowd with the “old stuff,” as well as his new single. And the end of the show was Brooks by himself on stage with an acoustic guitar, interacting with the crowd and taking song requests from poster board signs. It made a jam-packed arena of people feel like they were at an intimate show. Brooks was also visibly emotional at times, during songs like “The River,” when the crowd turned on phone flashlights and filled the fieldhouse with sparkling lights. Or, near the end with “The Dance” and “Unanswered Prayers” and “New Way to Fly,” as the lyrics lend themselves to a beautiful and quiet introspection, particularly when everyone sings along. With five shows in four days in downtown Indianapolis, the economic impact of Brooks in town is tremendous. The show wrapped up just before midnight and there were plenty of hungry people spilling into nearby bars and restaurants. And Brooks notes publicly that adding shows when the original dates sell out quickly is his way of fighting back against ticket scalpers and bots. With tickets priced at $67, he ensures fans of all stripes can afford the chance to participate. In the end, Brooks’ long-awaited return coupled with the horrifying events of Sunday still fresh in people’s minds turned this night into more than a concert. It served as an opportunity for Hoosiers to come together despite fear and sadness and disagreements over politics, sports or anything else. We sang and danced and screamed our hearts (and voices!) out, and Brooks was clearly grateful to be back on stage in Indianapolis to help him heal, too. If you’ve got tickets for his other shows, I hope the experience is similar for you. Tip: If you have a song you want to hear live, your best bet is to write it on a poster board and bring it along! And we can’t forget football fans who also love country music. You might recall the last time Brooks played here. In March 1996, he wore a Colts’ Jim Harbaugh jersey and reminisced about the quarterback’s near miss at leading us to the Super Bowl. Now the football team intersects with Brooks again. The bronze statute for Colts legend Peyton Manning will be unveiled at 3 p.m. on Saturday – the same time Brooks is starting his third of five concerts.